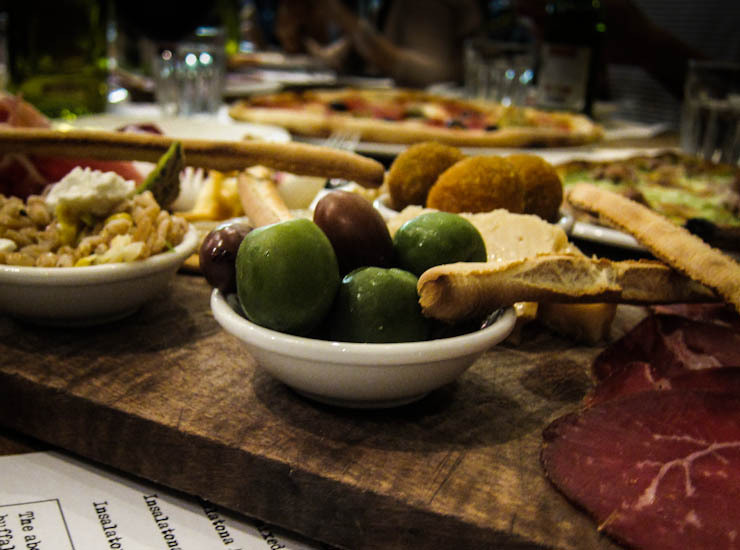 A few weeks ago Simon and I went out for dinner at D.O.C Pizza and Mozzarella Bar (295 Drummond St, Carlton) with fellow blogger friends Bryan (+ Fakegf), Winston, Daisy (+ Mr. Bao), and Yasmeen. It was great fun. We chatted, we ate, we ate, we ate, we chatted, we ate some more... and finally left with very, very full bellies. Now as a disclaimer, I tend to struggle a little as a food blogger when I have to keep track of and pay attention to more than a few dishes in one sitting, and have even given up on processing such posts in the past, so bear with me if this one is not quite up to scratch! Let's start with an easy one - drinks. The Baladin range of soft drinks on the menu caught our eyes. I got the Spuma and Simon had the Ginger. On paper, both sounded similar, stating ingredients such as orange peel, vanilla and spices. Upon drinking both, we discovered the differences. 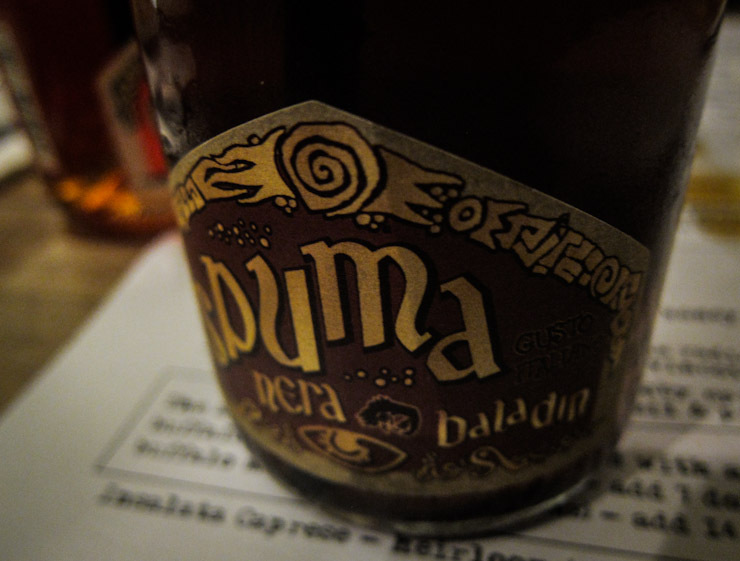 Spuma had a more bittersweet herbal quality to it, probably due to the use of Chinese rhubarb, while Ginger had sweetly seductive honeyed notes that melted upon the tongue. Soft drinks from Italian brewery Le Baladin. Here, the Spuma Nera. We had a long rectangular table, so for the main savoury meals, we divided into two parts of four - thus, Winston, Yasmeen, Simon and I shared a few pizzas amongst ourselves, while Bryan, Fakegf, Daisy and Mr. Bao in turn had their own selections. Winston had been to D.O.C. before and he suggested we get the antipasto platter - a daily assortment of selected ingredients. I'm not sure if I can identify everything properly, but my favourites here would be the bresaola (air cured beef) and smoked Scamorza (a smoky mozzarella in the fior di latte style). There was also a very strong, crumbly cheese which was too pungent for a few of us to handle, and even those who liked it could only have a little bit at a time. Made for good fun passing it around and checking out everyone's expressions as they tasted it for the first time! 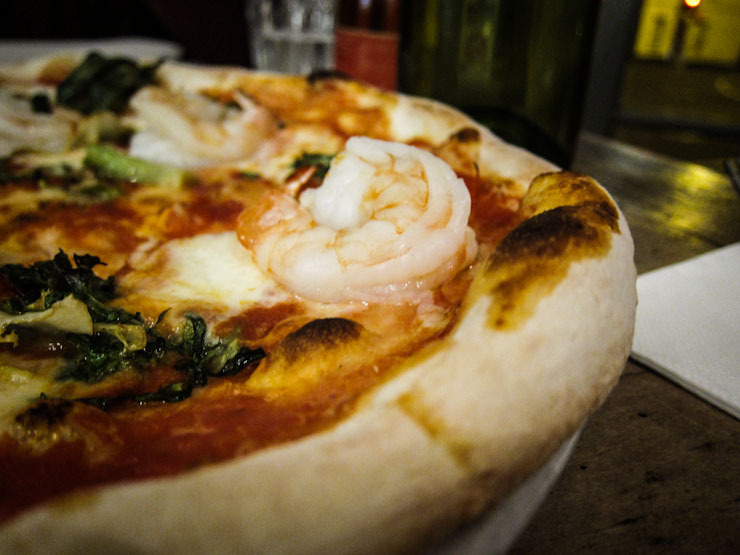 Pizza Tiger Prawns with tomato, mozzarella, endive, fresh chilli. It's a nice, fresh combination of flavours. I would've liked there to be more than one prawn on each slice, though... am I greedy? 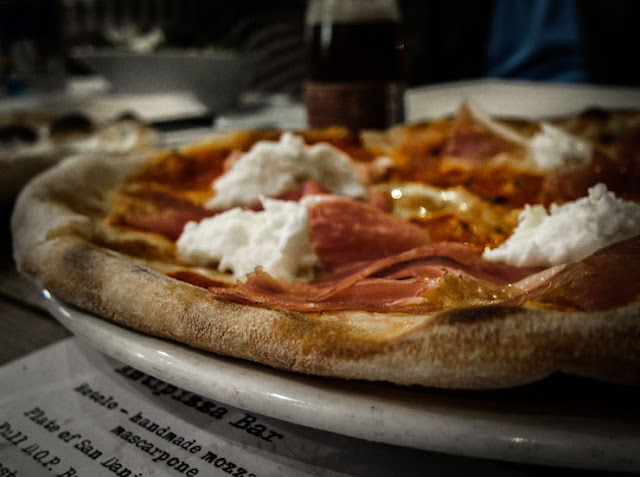 Pizza San Daniele with San Marzano tomato, fresh DOP buffalo mozzarella, DOP San Daniele Prosciutto. I've actually never been too keen on prosciutto as it's generally a bit too funky for me, but the prosciutto in this pizza is quite subtle and delicate. Pizza ai Porcini with wild mushrooms, truffle oil in bianco with grated DOP pecorino. Mushroomy, earthy, and creamy, this is my favourite out of the three. 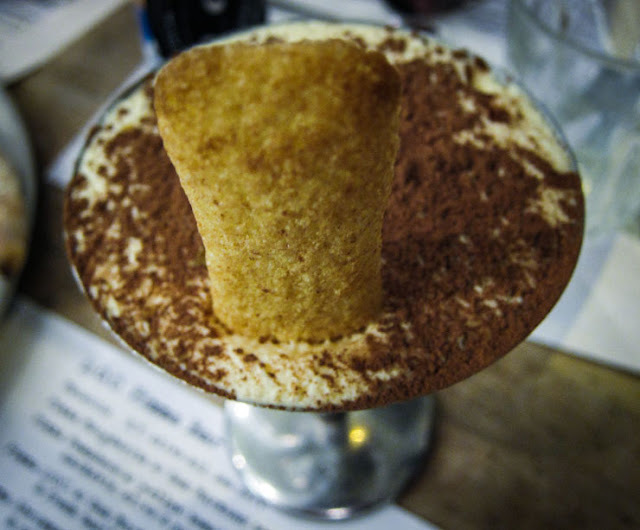 Sweet goats cheese, tiramisu with pavesini and montenegro. I'm not big on tiramisu desserts and wouldn't have gotten this if I was by myself, but I was surprised by how much I adored this one. It's light, it's sophisticated, it had me going back for more. 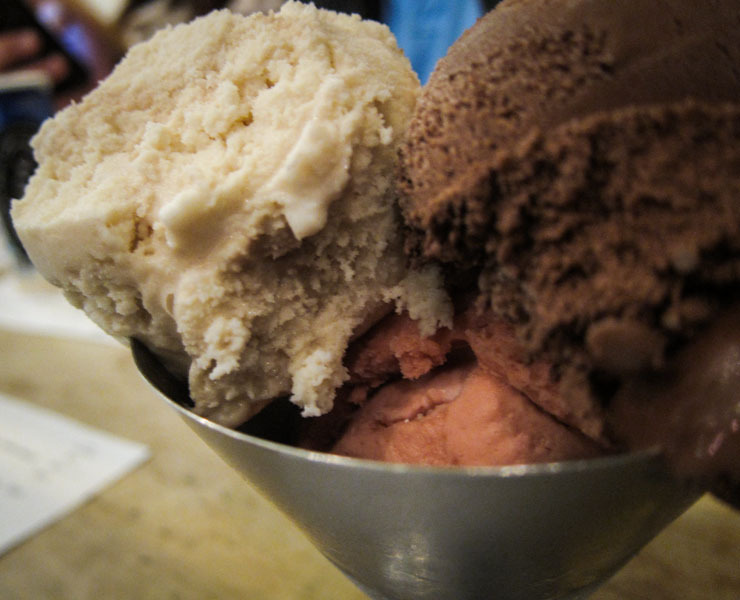 Coppa gelato - a delectable cup of mixed gelati. The chocolate one was easy to identify; the pinkish one was suggested by the others to be strawberry, though for some reason it tasted more like blood orange to me; and then there was one that was reminiscent of eggnog, which in retrospect was probably zabaglione. Nutella calzoncino with vanilla bean ice cream. 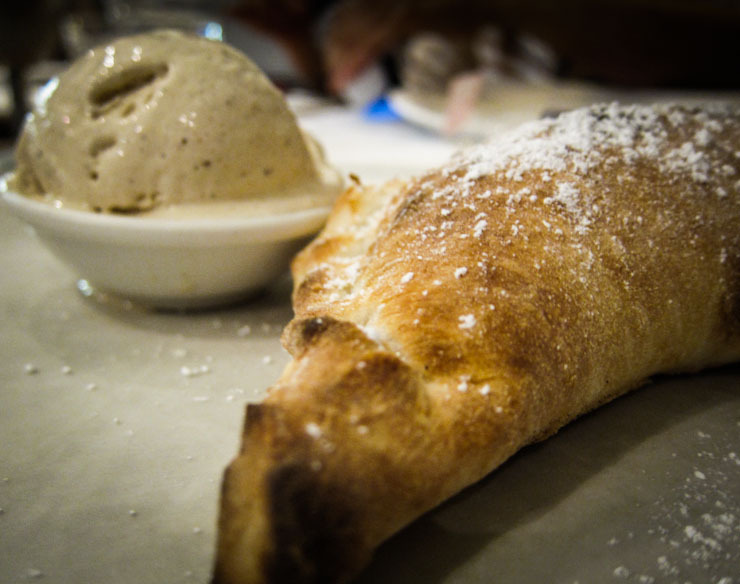 With that classic chocolate hazelnut filling, the little calzone, along with the ice cream, made for sticky, sinful comfort food. 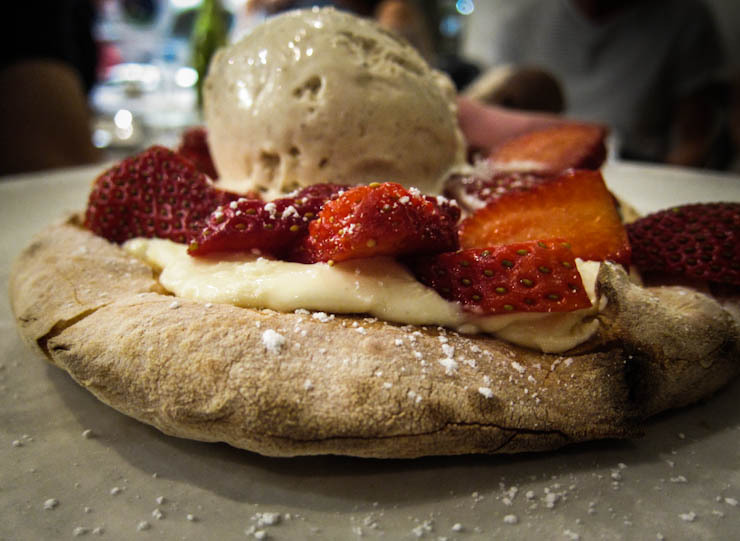 Sweet pizza with Belgian white chocolate, fresh strawberries, vanilla bean ice cream. Even though I don't usually go for white chocolate, I really looked forward to this one, because it sounded absolutely lush, and it did not disappoint. So satisfying! 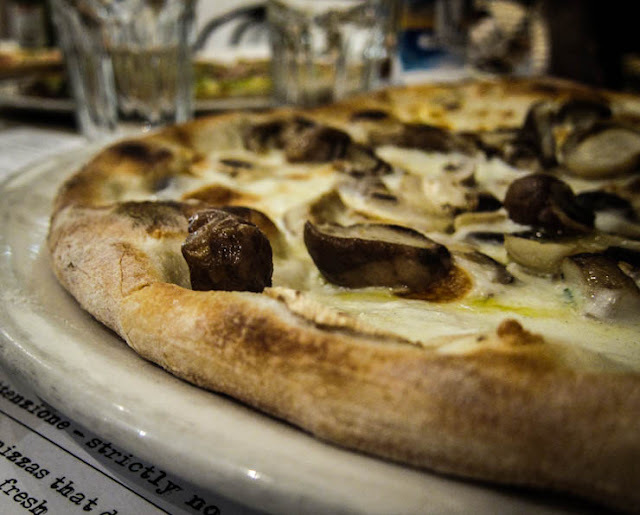 All in all, I had a very positive first impression of D.O.C, and I would return again as I am quite interested in trying some of the other pizzas. Simon did feel that it was a bit pricey, however, with each pizza clinking in at around the 20-dollar mark, so we'll have to see how we go! 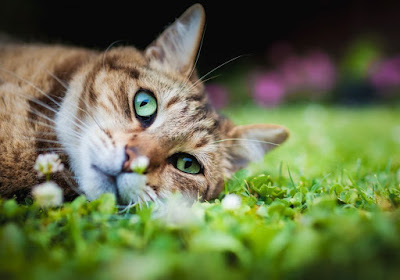 that food looks sooooo good! Ahahaha you guys still remembered my reaction to that cheese, it was very odd indeed! But hey Leaf, no need for memory disclaimer, you described the food in more detail than my own post, haha! But I had no idea $20++ is expensive for a pizza, used to paying that price, lol! I think it's partly because some of the pizzas uses the imported mozzarellas. I'm with Bryan - I think for the quality of the ingredients, the prices are reasonable. On that note... do they do reservations for small parties, anyone know? Not sure about party reservations, I suppose it can't hurt to call them and ask! Seems like the upstairs area might suit for something like that? I am a pizza fiend, and I have to say that crust looks perfect, just the way I love it. Drat, now I want pizza. Wow! That's a lot of food! This makes me miss pizza a lot. When I lived in NYC, I ate great NY pizza all the time. Now that I live in Texas, good pizza is hard to find. The desserts look great too. Makes me full just looking at your photos. Oh my goodness this meal looks so tempting and delicious! And so fun to get together with other bloggers to enjoy a meal. Yes, it's nice meeting up with fellow food bloggers! Haha I see I'm not the only one who feels overwhelmed when it comes to crafting blog posts on the more substantial/epic visits! I'd be up for going back too - I remember having some pizza envy looking at the one you got! I don't think you are greedy as I think there should be at least 2 prawns on each slice. $20 is a bit pricey even by Sydney standards as pizza joints are so competitive here, you only need to find your favourite and just go back again and again. From reading Winston's blog, I can see he's pretty cluey on where to find good food in Melbourne. I am such a sucker for a good plate of olives. I am going to Melbourne next month. Taking this info with me! Ooof $20 pizzas. I would much rather just have a giant bowl of those mushrooms, $20 worth. Pile 'em high! Those soft drinks sound intense and fantastic!